Compound A (C5H12O) is oxidized using aqueous chromium (Jones reagent) to compound B (C5H10O2), which is then treated with methanol under acidic conditions to yield compound C (C6H12O2) and water. 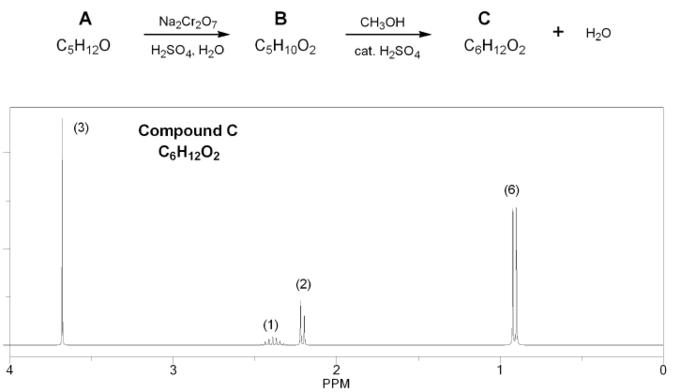 The 1H NMR of compound C is shown below. 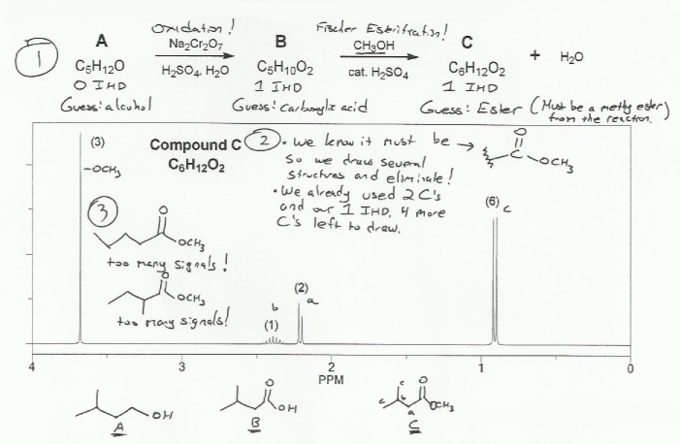 Determine the structures of compounds A, B, and C.
Let's solve this NMR structure elucidation problem using steps similar to those used in problem 662. Compound A has one oxygen and after treatment with aqueous chromium becomes compound B, which has two oxygens. This means A is probably an alcohol, B is probably a carboxylic acid. Compound B is then treated with methanol under acidic conditions to form compound C. These are conditions for a Fischer esterification, so C is probably the methyl ester. 2. How many IHD are there? Compound A: C5H12O = C5H12 should be C5H12 (CnH2n+2) so 0 IHD. Compound B: C5H10O2 = C5H10 should be C5H12. Missing 2H, so 1 IHD. Compound C: C6H12O2 = C6H12 should be C6H14. Missing 2H, so 1 IHD. These IHD counts fit our assumptions from part 1). 3. Draw some structures and eliminate, learn, repeat. The isopropyl splitting pattern is present: d(6) (signal c at ~0.9 ppm) and multiplet(1) (signal b at ~2.4 ppm). The s(3) at ~3.7 ppm is probably the methyl group from the methyl ester. We know from before we have one IHD, and it's probably an ester. So start drawing structures and eliminate those that don't fit the data! MendelSet practice problem # 679 submitted by Matt on July 19, 2011.